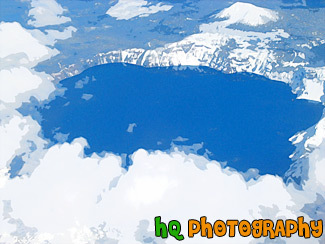 A scenic sky picture taken of Crater Lake which is located in Oregon State. Crater Lake is the deepest lake (1,949 ft or 594 m) in the United States. It is is filled with rain and melted snow that fell within the caldera basin. Crater Lake is isolated from surrounding streams and rivers, so there is no inlet or outlet to the lake. 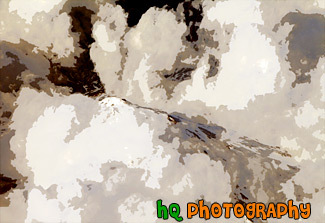 This picture was taken when there was still plenty of snow surrounding the lake. 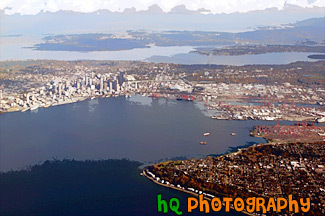 This is an aerial view of Seattle, Washington taken from an airplane flying into the SeaTac Airport. From this photo you can see the city of Seattle, the tall buildings, the Space Needle, and the bay and water. You can also see the Seahawks and the Mariner's stadiums. From this photo you can actually see it ALL! You can see I90, 520, Lake Washington, and Lake Sammamish in the far distance! This photo is a scenic aerial shot taken over the land around Phoenix, Arizona as the plane was getting ready to land at the airport. In this photo you can see the scenic land through all the puffy clouds. 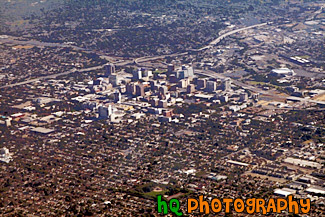 A scenic aerial daytime photo taken of the tall building and surrounding areas of downtown San Jose, California. A scenic aerial picture taken of a couple farms and farmland located in the small town of Enumclaw, Washington. This picture was taken from up Mt. Peak which is a popular local hike that people do for a great workout. 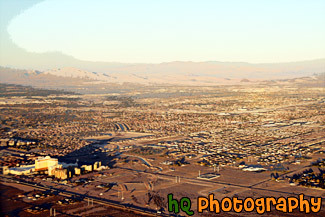 A scenic aerial picture taken of the city of Las Vegas on a sunny evening. You can see the desert land in this picture. 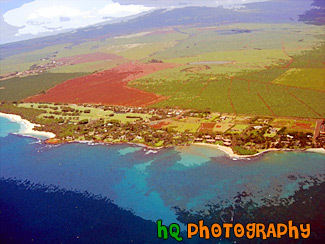 This is an aerial shot of Maui, Hawai'i as the plane was leaving the airport. 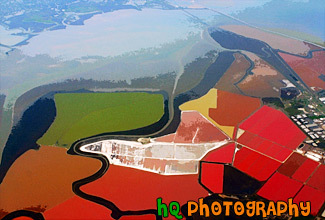 A scenic aerial picture taken of the Puget Sound area in Washington State. This picture was taken on an overcast, cloudy day. A scenic picture taken from an airplane of the bay area of San Francisco, California. In this photo you can see the colored waters of the bay area as the plane fly's north over it. 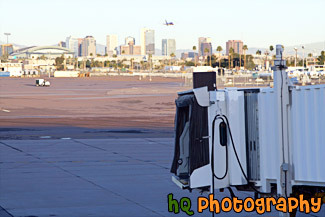 A scenic vertical picture taken of an airplane loading passengers at the terminal during sunset in Phoenix, Arizona as you can see the sunset colors in the background. 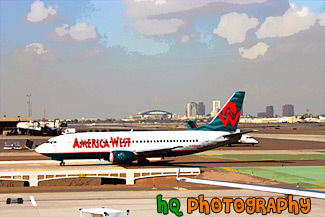 This photo was taken of an American West aircraft at the Phoenix Airport in Arizona. This day was a beautiful day as the clouds were scattered and puffy. In the distance you can see the city of Phoenix. 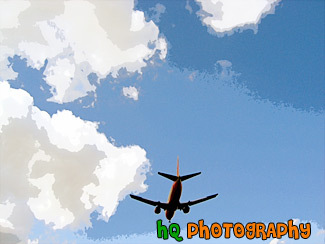 A picture taken of an airplane flying overhead on a beautiful sunny day at the Sea-Tac Airport in Tacoma / Seattle. Partly cloudy sky is seen with blue sky and puffy clouds. 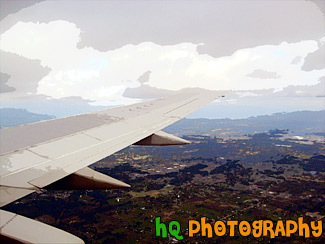 Aerial picture taken of an airplane wing while flying into the Seatac Airport in Seattle / Tacoma, Washington. This photo was taken from the airplane as it was getting ready to land. 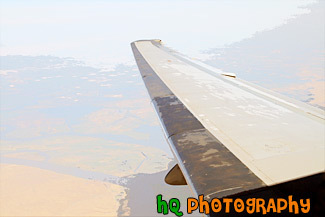 You can see the landscape of Washington State below the wing. 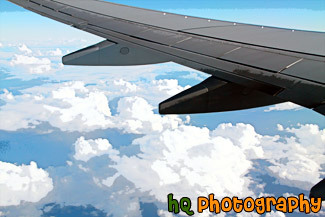 A scenic picture taken of an airplane wing while the plane is flying in the sky. A scenic picture taken of an airplane's wing from looking out of the passenger window. Blue sky and clouds are seen in the photo. 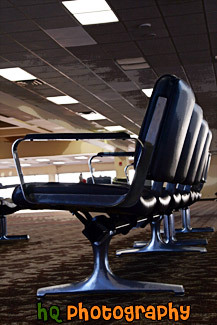 A close up vertical picture taken some airport seats located at the Phoenix Airport in Arizona State. 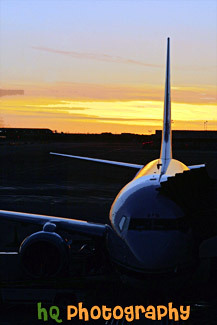 A scenic picture of an Alaska Airlines airplane getting ready to depart from the terminal during dusk/early sunset at the Seattle / Tacoma International Airport. 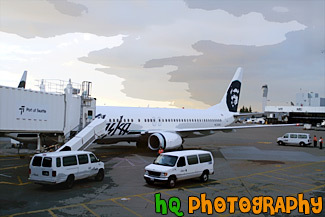 A scenic vertical picture taken of an Alaska Airline airplane at the terminal loading up passengers. In the distance you can see the city of Phoenix, Arizona. This is a scenic aerial photo taken over Phoenix, Arizona on the way to landing at the airport. 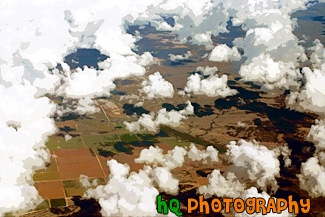 In this photo you can see the landscapes of Arizona as well as the puffy clouds in the sky. 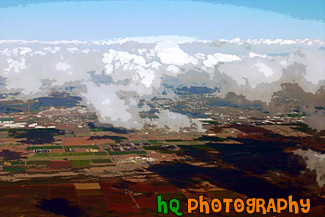 A scenic aerial picture view of the country land of Enumclaw, Washington looking down from Mt. Peak. 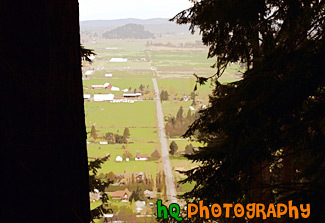 You can see the countryside and farms while looking through some evergreen trees. 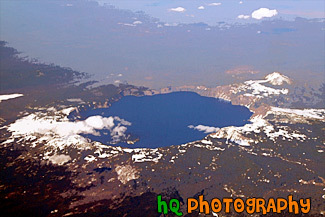 A scenic aerial picture looking down at Crater Lake which is located in the state of Oregon. This is a photo of an American West aircraft driving into the terminal just after it had landed so it can let all the people off the plane. 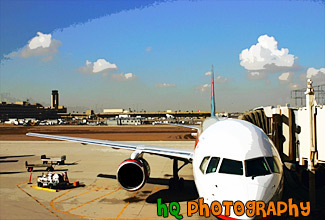 This photo was taken at the Pheonix Airport. 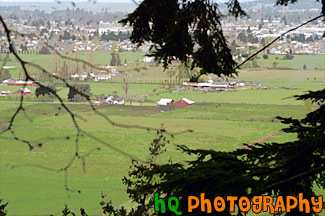 A scenic picture looking down at a farm in Enumclaw, Washington from a trail on Mt. Peak. Mt. 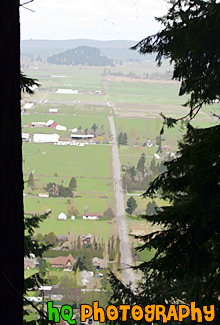 Peak is a popular hiking trail that the locals of Enumclaw go up for a great workout. A scenic vertical picture looking down at a neighborhoold located in Eastern Washington at Grand Coulee. An aerial picture taken of a mountain from an airplane. This mountain has snow covering it and is barely visible through the clouds. 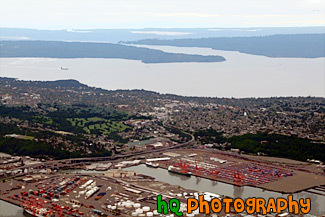 A scenic aerial photo taken of Western Washington and the Puget Sound area from the top of Mt. Si which is located in North Bend. 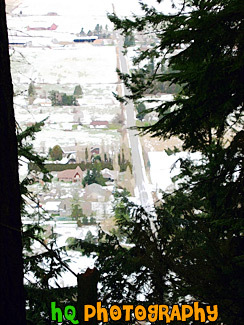 This is a scenic photo overlooking the country land of Enumclaw, WA on a snowy, icy day. This picture was taken on the trail of Mt. Peak. Mount Peak is a popular hike many people of Enumclaw and the surrounding cities go on. 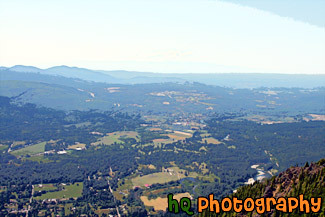 The hike is about 1 mile up to the top of the peak to where you can view almost the entire city of Enumclaw. Enumclaw is a small town located about 30 miles from Mt. Rainier and about 50 minutes southeast of Seattle. 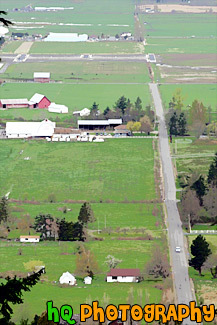 Most of Enumclaw's land consists of farms and fields with many houses containing acres of land. 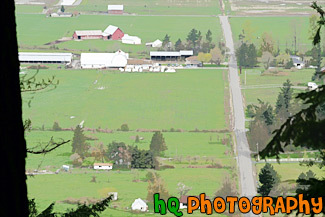 A scenic aerial view picture taken of the country land and farms of Enumclaw, Washington while looking down from Mt. Peak. Mt. Peak is a popular hiking site for the locals around this area. 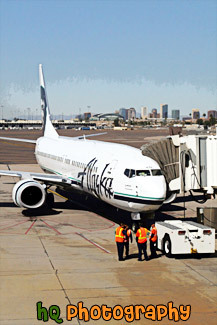 A scenic picture taken from the Phoenix Airport looking towards the city of Phoenix and an airplane taking off over the tall buildings. 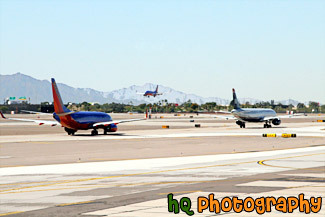 A scenic picture taken of some planes taxing and landing at the Phoenix airport in Arizona. This photo was taken on a sunny day. 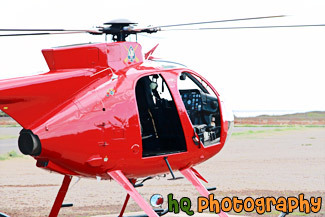 A scenic close up picture taken of a red helicopter on the island of Kauai, Hawaii. This helicopter was used for rescue missions as well as for tours of the island. 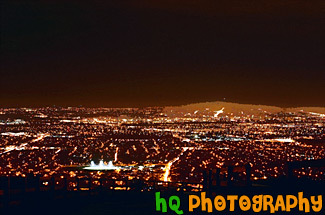 This shot was taken from South East San Jose, California on the eastern hills during the night time. The shot is overlooking the South Bay and San Jose. In the middle of the photo you can see a football field lit up in the dark. 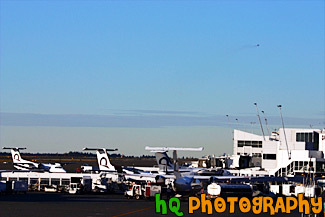 A scenic photo taken of some airplanes and the airport at the Seattle / Tacoma International Airport. In the sky in the background you can see an airplane that had just taken off from the airport. 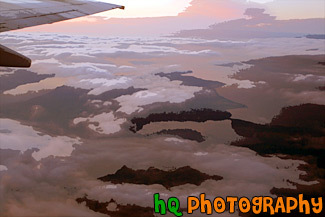 A scenic aerial picture taken during a sunset looking down at the Puget Sound in Washington State from an airplane which has just taken off from the Seatte/Tacoma International Airport. Through the clouds you can see the sound and islands of Washington State. 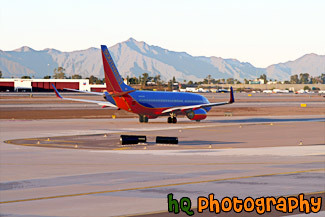 A scenic picture taken of a Southwest airplane about to take off at the Phoenix, Arizona airport. 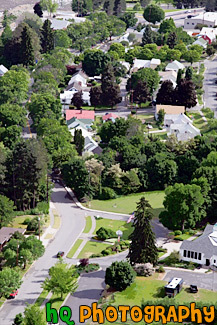 An aerial picture taken of some farmland and the small town of Enumclaw located in the background. This picture was taken from a trail on Mt. Peak which is a place where many locals go for a great hike/workout.